A story of survival Avro Lancaster X lthough more than 7,000 Avro Lancasters were built, just two remain airworthy today. European airshow audiences are very familiar with the Battle of Britain Memorial Flight (BBMF)-operated Lancaster B.l PA474, but this summer, a once in a ‘Lane-time’ opportunity exists Canadian Lancasters. As the war situation worsened Britain turned to Canada to help with aircraft production. The National Steel Car Corporation’s new aircraft plant in Malton was chosen for the construction of Lancasters and drawings arrived in January 1942. That summer Lancaster B.I R5727 was flown to Canada to act as a master tool and pattern standard. Canadian-nunt examples were designated as Lancaster Xs and were largely built to the same specification as the B.III and fitted with Packard Merlin 38s or 224s. It was critical that there could be complete inter-changeability of all major components between British and Canadian sub-assemblies, so that modifications, repairs and battle-damage replacement could all be carried out in England. After various management difficulties, the National Steel Car Corporation Aircraft Division was taken over by a Crown company and necame victory Aircraft. KB700 was the first Lancaster off the production line, making its maiden flight on August 1, 1943. It was christened Ruhr Express and much publicity surrounded its naming and departure to the UK, where it arrived on September 15. Later, after completing its 49th mission, KB700 suffered hydraulic problems on landing, overshot the runway and crashed into a piece of farm machinery. Its crew fortunately all escaped, though KB700 burst into flames and was destroyed – it was due to ceremoniously return to Canada after its 50th ‘op’. On arriving in England, Lancaster Xs were assigned to 6 Group, the RCAF component of Bomber Command. In all 430 examples were built, with the last – FM229 – being completed in August 1945. Post-war the RCAF found many productive uses for the low-time airframes, and they were variously modified for the respective roles given to them. The type was ceremoniously retired from RCAF service on April 8, 1964. Today Canada is home to the largest number of surviving Lancasters, with seven aircraft on display and two more under restoration. However, the most famous of these is the CWHM’s airworthy FM213. This airframe was built in July 1945 and was one of the last off the production line before it was shut down a month later following the completion of FM229. Initially sent into storage, FM213 was taken on strength by the RCAF on June 21, 1946 and converted to 10MR/MP (Maritime Reconnaissance/Maritime Patrol) configuration in 1951. The famous de Havilland Canada (DHC) test pilot George Neal test flew FM213 on December 16, 1951 and it was assigned to 405 Squadron in Greenwood, Nova Scotia and given the unit code AG-J. After only 10.5 hours of test flying it was heavily damaged on its ferry flight to Greenwood when it stopped in Trenton, Ontario. The pilot chosen to ferry the Lanc to Greenwood had flown only 10 hours dual and one-hour solo and while landing in a gusty crosswind in Trenton the starboard tyre blew after his third bounce and the starboard landing gear collapsed in the ensuing groundloop! FM213 was dismantled and shipped to DHC and put in storage until 1952 when a new centre section was acquired in Penhold, Alberta from a farmer who had purchased Lancaster X KB895 and intended to convert it into a tool shed! The centre section was subsequently shipped to de Havilland and FM213 was rebuilt with the fuselage of KB895. It was test flown by DHC’s Bob Fowler in 1953. From then on FM213 went on to lead a trouble free life in the RCAF, initially at Greenwood and later with 107 Rescue Unit in Torbay, Newfoundland. The airframe was eventually retired on November 6, 1963 and flown to 6 RD Storage Depot at Dunnville, Ontario. By this time it had amassed 4,392.3 hours. This should have been the end of FM213, which was headed for the scrapheap, but Bill Clancy of the Royal Canadian Legion’s Branch No 109 in Goderich, Ontario stepped in to save the aircraft. Clancy petitioned the RCAF to obtain a Lancaster to put on display at the Goderich, Ontario airport as a memorial to the airmen who served in the RCAF. Fortunately, FM213 was mounted on her jack points to minimise structural damage and stress, a fate not shared by most Lancasters displayed in Canada. More than a decade later, on July 1, 1977, the CWHM under the leadership of Dennis Bradley acquired FM213 from the Legion with a view to restoring it to airworthy condition. But first the museum needed to figure out how to get the aircraft to its headquarters… Luckily, thanks to the RCAF’s 450 Sqn, a Boeing CH-147 Chinook helicopter was provided and after removing the engines, propellers, outer wings and tail the Lancaster was lifted to the CWHM base at Mount Hope Airport in Hamilton, Ontario on November 5, 1979. Between 1979-1983 CWHM volunteers undertook a variety of work on the airframe, but as they were also working on the museum’s Fairey Firefly progress was very slow. However, in 1983 the museum received a grant from the Federal Government as well as a new Chief Engineer in the form of Norm Etheridge. Norm was a well-respected aircraft engineer in Canada with vast experience from his days in the Royal Navy and Field Kenting Aviation where he worked on B-17s, A-26s, P-38s and Lockheed Hudsons. He became a key figure in the restoration of the Lancaster and was assigned this task upon his arrival. The grant also allowed the museum to hire four assistants and Norm’s crew set about restoring FM213 on March 24, 1983, assisted by numerous volunteers. 1985. This RCA allowed the DOT in Ottawa to supervise the restoration from arms length and the CWHM to certify the Lancaster without having the endorsement on a private aircraft mechanics license. The late John Sandberg’s JRS Enterprises also helped out by arranging a ‘gentlemen’s agreement’ to overhaul FM213’s four Merlins plus a spare. However, when JRS received the engine blocks they were found to be in such poor condition that the search was started for others. The CWHM eventually found more than 20 engines to send JRS from which they received the five overhauled units. The first engine runs were completed on August 10, 1988, some 24 years after the aircraft had last run. Assistance also came from the BBMF, who helped with parts and expertise and parts were also received from various Lancasters on static display across Canada. First flight for the newly registered C-GVRA was planned for September 10, 1988 with the crew consisting of Sqn Ldr Tony Banfleld of the BBMF, co-pilot Air Canada Captain Bob Hill and Engineers Tim Mols and Norm Etheridge. Unfortunately, a magneto drop delayed the flight by a day. However, at 13.25 on Sunday September 11, 1988 FM213 lifted off for her first flight to the applause and tears of joy from the numerous volunteers in attendance. During her restoration FM213 had been painted in the markings of KB726 of 419 ‘Moose’ Squadron, complete with the unit codes VR-A. On September 24, 1988 flew again and was dedicated to Andrew Mynarski, who lost his life aboard KB726 and was posthumously awarded the Victoria Cross. The original crew of KB726 this historic day, as well as their families and Mynarski’s sister.was on hand on over 25 years later, the Lancaster still thrills crowds in Canada and the USA. When not on the airshow ‘circuit’ it can often be seen flying local flights out of the CWHM’s base in Hamilton, Ontario providing many with a once in a lifetime opportunity to fly in one of the two remaining airworthy Lancasters. The CWHM offers a unique method of support, called the Bomber Crew membership. 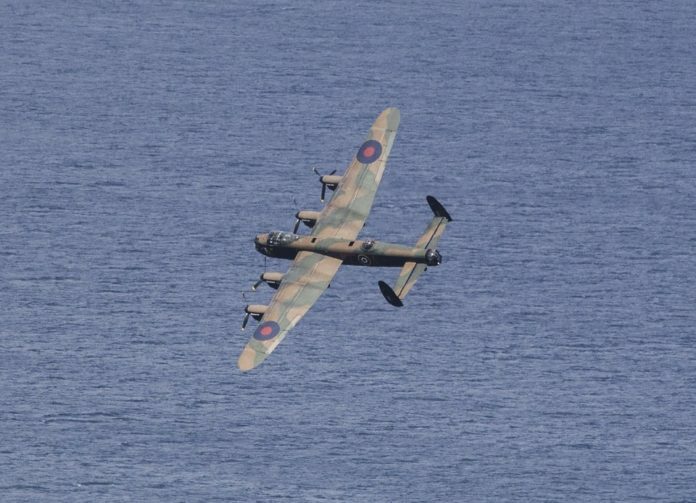 This not only entitles you to the benefits of belonging to and supporting the CWHM it also allows you to go on a one-hour flight in the Lancaster. Over the years many have taken advantage of this, and to fly in the ‘Lanc’ is a very unique, yet noisy experience! This summer marks a once in a ‘Lanctime’ event as the Canadian Warplane Heritage Museum has flown its prized Canadian-built Lancaster to the UK for a seven week long visit. The ‘Lane’ will join the Battle of Britain Memorial Flight’s PA474 at several events – be sure to catch it while you can. Many said it would never happen, a dedicated team has Ejl ensured it will.